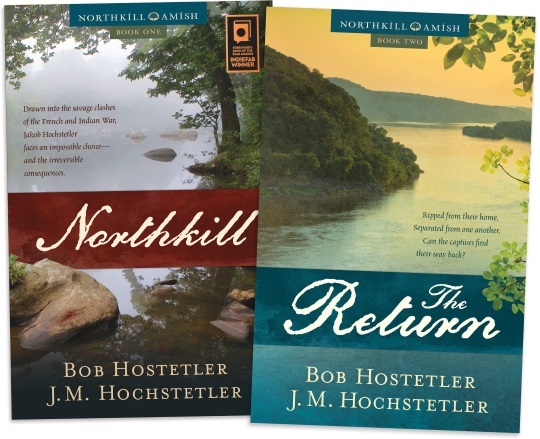 Several years ago we hosted a giveaway for the book Northkill, based on the Jacob Hochstetler massacre, famous in Amish lore. Authors Bob Hostetler and J.M. Hochstetler have returned with the conclusion to that story, The Return. I hope you enjoy today’s interview with Bob and Joan, in which they explain why this story is important to Amish and Mennonites, the historical basis of The Return, and why there are so many ways to spell their last name. You also have a chance to win an autographed copy of The Return. To enter, just share a comment on this post. I’ll draw a winner Monday. 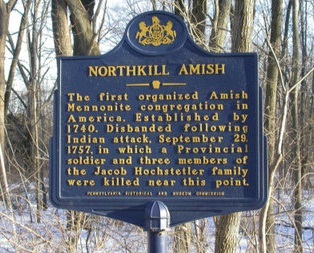 It is the second part of the story (begun in the 2014 novel, Northkill) of the Hochstetler massacre, a seminal event in the Amish and Mennonite communities not only because of its historical significance to the first organized Anabaptist settlement on this continent but also because of its affirmation of the doctrine of nonresistance. It tells the story of Jakob Hochstetler and two sons, who survived the massacre but faced captivity among the tribes that had taken them from their home, and of those who hoped for their return in the Northkill community of Eastern Pennsylvania. Are you each related to the characters in the story? Joan: I know that I’m descended from the oldest son, John, through his descendants Henry, David H., David D., William D., and Alvin W. My mother, Lula Bontrager, was distantly related to my father through the Hochstetlers in some way, but I haven’t done the research to find out whether her line leads back to John or to one of Jacob’s other children. One of my cousins on the Bontrager side has done an extensive genealogy, and one of these days I’m going to see if he’ll help me figure it out. Bob: I am also descended from John (through his son Daniel) and also from the captive Joseph (through his son Peter). My grandfather, David A. Hostetler, was born into an Amish family in Goshen, Indiana, where he was known as “Adam’s Davey.” Though he left the community as a young man, he maintained strong ties to his extended family and in the 1950s compiled a family history entitled Descendants of David J. Hochstetler with his aunt, Drusilla (Yoder) Hostetler. I am the third son of David’s first son, Charles Vernon Hostetler. Why are your names spelled differently? Bob: There are a number of different spellings in the family. In my case, my grandfather, David A., stopped spelling his name with the “ch” after leaving home. Joan: My family kept the “ch” and the German pronunciation of the first syllable, “hoch,” which means “high,” with a long “o”. Our ancestor Jacob—and undoubtedly most members of his family—couldn’t write, and the book of our genealogy, Descendents of Jacob Hochstetler (DJH), lists a number of guesses at spelling the name taken from various 18th century Pennsylvania documents such as land transfers and newspaper accounts of the attack. Just a few of the variants are Hoofstetler, Hooshstedler, Hostedler, Hostetter, Hoffstettler (the closest to the original German), and Houghstadler. I’m guessing the last one is an English person’s attempt to transcribe the German pronunciation, in which Hough would be pronounced like enough, which would actually be close. Once Jacob’s descendants learned to read and write, they spelled their name however they felt led, and sometimes their children and grandchildren changed it to something else. That’s why there are so many variations even though we’re all descended from the same ancestor. How true to history is the book? Bob: I’ll let Joan speak to any details she cares to mention, since she did all the heavy lifting, historically speaking, but a big part of the pleasure (and pain) of writing this kind of book is staying true to the things we know while filling in the parts we don’t know. Both of us wanted The Return to accurately reflect not only the facts and details we know from history but to stay as consistent as possible in the parts we had to imagine. For example, even in the final rewrite, Joan discovered a historical detail about Post, the Moravian missionary, that required us to go back through the book and change a number of scenes. Joan: It’s nothing short of amazing how much is actually known about the attack on our ancestors. To ground the series we used all the details from the accounts collected in DJH, both known facts and family stories that were passed down. We also mined accounts preserved in the Pennsylvania Archives and other sources that were compiled by Beth Hostetler Mark in Our Flesh and Blood, which gave us additional details that allowed us to expand the story. Because Mark included so much relevant material, Our Flesh and Blood became our “bible” for the timeline of the actual events portrayed in The Return and for real-life characters who appear in the story. We are forever in her debt! Obviously there were many details that we had to construct such as dialog, the personalities and descriptions of the various characters and relations among them, people they might have encountered, and cultural details of the Amish of that period for which there’s little documentation. There’s also no indication of where Joseph and Christian were held by the Indians, other than that one was with a Delaware chief named Custaloga. We don’t know exactly when they returned or how. So there were a number of issues we had to flesh out as best we could from historical hints we found. One instance is the real Moravian missionary Bob mentioned, Christian Frederick Post, who really did act as a negotiator to the Lenape for the governor of Pennsylvania exactly as we portrayed it, which added an interesting dimension to the story. Overall, this series is as factual and authentic to the time and the Amish culture of the day as we could make it with the resources we had available. Did you learn anything new about your ancestors in the research and writing process? Bob: Tons. Before starting on this project, I knew the broad outlines of the story, and of course most of the detail I knew revolved around the 1757 massacre itself. Much of the subsequent story, however, which The Return relates, was uncovered along the way. Joan: I was very familiar with the historical section at the beginning of Descendents of Jacob Hochstetler. But the details Beth Hostetler Mark compiled, which includes Jacob’s interrogation by British Colonel Bouquet at Carlisle after his escape and before he finally reached home, were totally new to me and nothing less than gripping. In it Jacob gives a detailed account of his movements from the time he was carried away by the Indians up to his rescue by the British at Fort Augusta, including the number of days it took to get from one place to another. He had to have been an extraordinarily resourceful and determined man to do what he did, and then find and bring his boys home. Why should Amish or Mennonite people be interested in this story? What about non-Amish or non-Mennonite readers? Bob: This story continues to resonate throughout the Amish and Mennonite communities, because it is a vivid example of Jesus’ teachings and of the courage it often takes to live a truly nonviolent, forgiving, Christian life. It also presents a powerful testimony to the contemporary church and the world today. Joan: I absolutely agree with Bob. Our ancestors’ story is the great defense of nonresistance, the seminal story of the Hochstetler family, and a quintessentially American story of immigrants to this country who became pioneers on the American frontier. That makes it a hugely important story not only for the Amish-Mennonite community, but also for everyone who wants to understand American history. Historical fiction is very popular, and I’ve always believed it to be a highly effective teaching tool as long as the story is carefully researched so that it’s factually accurate and authentic to its time. In writing this series we wanted to get to the core of who the Amish and Mennonites are, and you couldn’t find a better story to illustrate that than this one. What do you hope readers will feel or think after reading The Return? Bob: The first rule of fiction is to entertain and this is a riveting story. So I hope people will find it absorbing and worth recommending to friends and family. Beyond that, though, I truly hope The Return will make readers confront the beauty of the Gospel of Jesus Christ—as well as its demands. I hope people from all sorts of backgrounds will think more thoroughly and more “Christianly” about retaliation, resentment, war, and peace as a result of having read The Return. Joan: Amen, Bob. If you don’t entertain readers, they’re not going to read the story, and there’s no point in writing it. But if it isn’t grounded firmly in truth and doesn’t offer deep spiritual insights, then it isn’t worth writing. We hope that we’ve been able to entertain, challenge, and inspire readers through the extraordinary story of how God faithfully worked out His perfect plan through the trials our ancestors suffered—and that that will inform how they deal with their own times of trial. And we pray that Jesus will be glorified in this series and that through it His grace will abound to those who read it. UPDATE: I used random.org to select a winner – and it was #30, Carl Brecht. Congratulations Carl, drop me an email at ewesner(at)gmail(dot)com and we’ll sort out getting your book to you. If you didn’t win and would like a copy, The Return is available online here as well as on Amazon. And a thanks to Bob and Joan for the Q-and-A and giveaway. 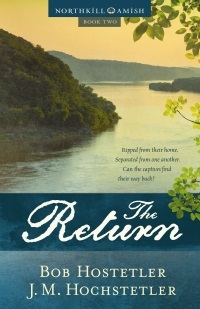 UPDATE 2: If you’re in the Berlin, Ohio area this weekend, Bob and Joan will be doing a signing of The Return from 9-1pm at the Gospel Book Store. Love the books and the family!!! I am so anxious and excited to read The Return. I loved Northkill. It is wonderful to read about the historical things that happened to ancestors. These books have helped me learn more about family history and has led to having a connection with others through Facebook also related to the same ancestors. Thank you for doing all of the research and sharing the history, story and family with us!!!! Shelley, thank you for your comments! Our family is truly blessed to have such an inspiring story as our legacy. Bob and I consider it a great privilege to be able to bring this story not only to the family, but also to a wider audience. I can’t wait to read The Return. I love learning more and more about the history of the people of our country, but when it involves a family of someone we actually know & love, it makes it even more exciting! We should continually try to learn from the past and also see a smidgen of God’s plan in the making! Truth and Grace will always prevail! Cindy, I couldn’t agree more that we need to learn from the past, particularly today. Truth and grace will indeed prevail. Thank you so much for stopping by, and good luck in the drawing! I would love to win a copy. Sadly, I’m not familiar with the authors, but I love reading about Amish. I live near a couple of Old Order Amish districts and enjoy driving around seeing their farms and their way of life. I read all Amish books I can possibly read. I have a huge To Be Read Pile…My maternal side is from York County, PA and I descend from PA Dutch ancestry….although not Amish….pretty close. I’ve always dreamed of “living an Amish life”. This would be perfect for our public library! I would love to read this book as I am very interested in the Amish. Growing up I lived very close to the Amish in the Amana Colonies in Iowa. When I am finished I will give this to our public library so that others may share this wonderful book. Thank you, Rayanne! We hope to get this series into a lot of libraries across the country. It helps a lot if readers request it, and our publisher, Sheaf House, is very happy to work directly with libraries to provide the books at a discount. It’s amazing how much historical information is available about this. It was well documented! I am so anxious and excited to read The Return. I loved Northkill.Historical fiction based on fact is my go to genre and this is at the top of my list to read! You are so generous, Joan and Bob. Thank you for the giveaway opportunity! Deanne, the information available about this event sure was a tremendous help in making this story true to life. Thank you for your kind words about Northkill! I think you’ll find The Return an exciting and inspiring read as well. It was fascinating to delve deeply into the lives of the Native American tribes of the day. We ended up being very moved by what all 3 of the captives must have endured and how wrenching it must have been for Jacob to have his sons taken away from him, and for Joseph and Christian eventually to come back. I hope this story truly blesses our family and all those who read it! This is a book I cannot wait to read. I just started Northkill last night, and was getting ready to finish it up tonight (I’m a quick reader). An outstanding story well written, something lacking in most types of Anabaptist writing IMHO. Both of these books sound fascinating and I just love reading about the Amish and their ways of life. I’ll be adding these books to my pile of stories to read this Spring/Summer. Thanks for the chance of winning ‘The Return’. The last decade I have enjoyed, with a longing, learning of the Amish. Not just because I am curious, but because I admire and respect them for their love of God and their desire to live as He would have His people do. If more of us lived this way , what a better world this would be. I have been interested and intrigued in both the Amish and Mennonites since I can remember. Their simple, plain ways, their faith, their love of God, their all around simplicity. I enjoy reading and continually learning about their culture. I am so hooked on all the books that are out there that are truly amazing and make you feel like you step into their lives while reading them. Absolutely fascinating & addictive. I get started on a book & I can’t put it down. I attend various Amish Events around my community in support of them & their communities. I just feel like I learn more & more each time I read a book, visit an auction, or community event. I enjoy their lifestyle & their strong beliefs!!! I have never read “Northkill” but have heard of the story. Any particular book store or website carry this book? Really looking forward to this historical read. Debbie, you’ll find both books on christianbook.com and Amazon. Gospel Book Store in Berlin, OH, carries it, and so do some Amish bookstores and other Christian bookstores. So excited about this new release. I can’t remember ever looking forward to reading anything like this before. It’s likely due to this being a story that I grew up hearing about from my grandmother Grace Hostetler. I also developed a keen interest in those Hostetlers who migrated to Canada in the early 1800s and settled in New Hamburg Ontario. The beautiful fieldstone homestead still stands as a historic site and the influence of the Hostetlers is still evident in the town to this day. It’s a family heritage I value deeply and a story that has fascinated me since childhood. Very much looking forward to reading this next chapter. Michael, we’ve been friends forever on Facebook, and I didn’t know we’re related! Which of Jacob’s children are you descended from? The history of the Hostetlers in Ontario would be fascinating indeed to research. I’d love to find out how much is known about them and when/why they migrated there. I’ll bet there’s a very interesting story there! I have read many books on the Amish, but this is one I don’t have but would love to have to add to my growing library. Live near the Amish and Mennonites in my area and enjoy talking with and seeing all their buggies and the way they live. They are truly a people of nonresistance and believers in God. may God bless them. How did you go about starting your research? In the past 3 years or so I have become very interested in historical fiction as a way to start learning about history. I think if teachers in school would have children read some of the historical novels about the periods they want to teach, their students would find their subjects more interesting. My family has a very interesting background and I never thought to write about it. It’s a good way to learn about my ancestors and the hardships and pleasures they had growing up and becoming adults in their many varied businesses. My ancestors expand many miles and had some very important roles in history. Because of that, I would like to know how you started your stories. Annie, I agree with you about teachers using well-researched historical fiction to teach history, and I’ve advocated that for a long time. It’s the best way to draw readers, and particularly children, into a historical period and get them excited about it. I definitely encourage you to write your own family’s stories! That’s a wonderful legacy for the younger generations. I start by collecting the stories that have been passed down through the family, then research the period the stories happened in. What was going on then in the wider world that would have affected your ancestors? How did people live during the time, including details of their daily life, their occupations and how they carried them out, and so on. What important roles did they have in the period they lived in and how were those carried out? Then imagine their relationships with their family members and others they would have dealt with outside the family. Once you get started digging into it, you’ll be hooked! This sounds like an interesting read. Is the first one in libraries? Or where can I purchase it? I’d love to win a copy! I’m always trying to build my book collection! Thanks for this opportunity. Jess, both books are available from Christianbook.com and Amazon. Some libraries do have Northkill, and we’re hoping to get both books of the series in more soon. If your library doesn’t have it, it’s helpful if you ask them to get it. They often will stock books at reader request. Sorry folks that this is a day later than promised. I just used random.org to choose a winner – and it was #30, Carl Brecht! Congrats Carl, email me at ewesner(at)gmail(dot)com, and we’ll arrange getting your book to you. Thanks everyone else for the great comments! Ohhhh, I am so excited to know there is a follow-up book to Northkill. That was one of the best historical novels I’ve ever read..
Wandering off right now to see where I might get it quickest.